Last Halloween in West Hollywood, CA, Jason Gogerty and his partner, Ismael went to the annual West Hollywood Halloween Street Carnival in skull make-up. Jason told us that they "spent almost 4 hours painting ourselves with black body paint from our waist up", using "little makeup sponges. 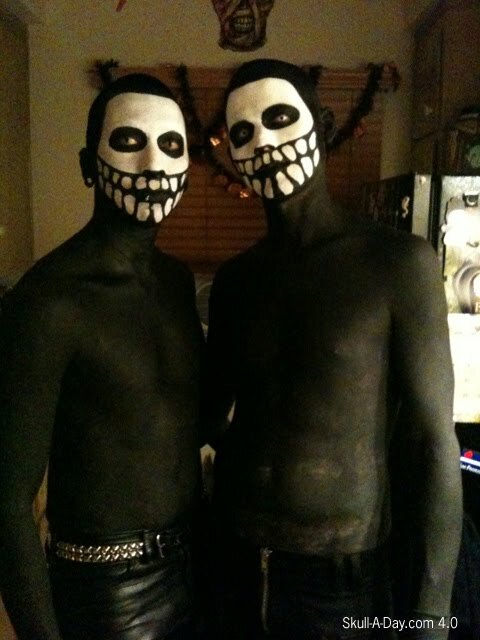 Then, used white paint to create a skull on our faces." 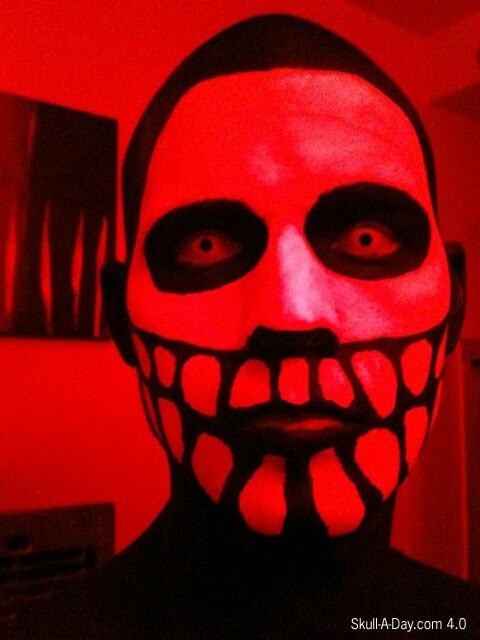 The 1st picture is of Jason, alone in the bathroom with only red lights on because, he thought the effect was cool. The second picture, is of Ismael and Jason together in their kitchen. Both of you did a wonderful job with the makeup. I like the stylized skull that you all painted with the half body black paint. I like how the red light changes the color of the white. That is the nice thing about white paint, it easily takes on a new tone according to the light around it. Black, having a color absorbing quality, tend to be black no matter what light it around.We have had skull make-up on Skull-A-Day before and each person has a different style of creating it. It reminds me of Dia de los Muertos, which is a celebration of the dead. What better way to celebrate it than to make your self up to look dead.